Sometimes the Accidental Locavore thinks you need to be a little sneaky about food. I saw this eggplant recipe in Food & Wine and it immediately appealed to me on three fronts: love of stuffed vegetables, something new to do with eggplants and ease of preparation. One small issue, eggplants are not my husband’s first choice—ever. So, when it looked like I was going to be alone with two house-guests for dinner… This is technically more of a topping than a stuffing and serves 4. 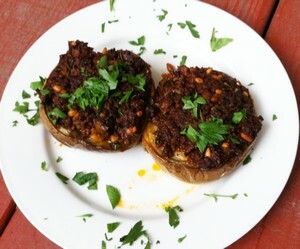 The Accidental Locavore shares a recipe for eggplants stuffed with ground lamb and pine nuts. A delicious and easy main course meal with eggplant. Preheat the oven to 425°. 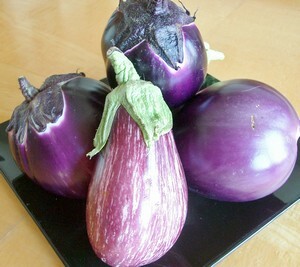 Arrange the eggplant halves in a large baking dish, cut side up. Brush with olive oil and season with salt and pepper. Bake in the oven about 20 minutes, until browned (mine took closer to 30 minutes). Meanwhile, in a small bowl, mix the cinnamon, cumin and paprika together, set aside. In a large sauté pan, heat 1 tablespoon of the olive oil over medium heat. Add the onion and half of the spice mix. Stir, cover and cook until the onion is soft, about 7 minutes. Add the lamb and cook, breaking up the meat with a wooden spoon until no pink remains, about 4 minutes. Pour off all but 1 tablespoon of the fat. Stir in the pine nuts, tomato paste, half the parsley, 1 teaspoon of the sugar, salt and pepper to taste. Spoon the lamb mixture onto the eggplants. In the bowl with the remaining spice mix, add the water, lemon juice, remaining sugar, salt and pepper. Stir to mix and pour into the baking dish around the eggplants. Add the cinnamon stick. Cover with foil and bake for 50 minutes, basting twice with the pan juices, until very tender. Plate the eggplants, discard the cinnamon stick and pour the remaining juices over the eggplants. Garnish with the parsley, serve and enjoy! My verdict: great! 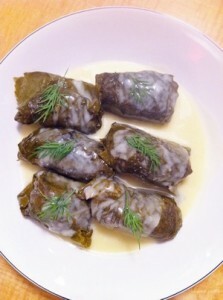 My guests thought it was “very delicious” and are dying for the recipe (here it is)! Next time I’ll make a couple of tweaks. First, I’ll substitute fresh mint for the parsley. The parsley is kind of a non-entity in the dish, while mint would just add to the Middle Eastern flavor profile. The other thing to go would be the tamarind concentrate. I happened to have some, but if you didn’t you could substitute pomegranate concentrate or juice or even some cranberry juice, or nothing…You could probably pre-cook the eggplants or even grill them and add the topping later. My Verdict II: Made a smaller batch and used mint instead of parsley. Going forward, I would use whatever was around. This time I sprinkled the eggplants with some of the cinnamon and cumin before cooking them (like the eggplant salad). Be careful when doing small batches of this and/or using a shallow pan. The sauce cooks down quickly and you might have to add some water to the pan. For batch 2, I only cooked the eggplants for 45 minutes and think they could have come out after 35-40 minutes. * Tamarind concentrate is used for Asian and other foods and can be found on Amazon. com. This is a long-time favorite of the Accidental Locavore. When properly prepared, it’s delicious! Even when it’s a work-in-progress, it’s pretty good. A little time consuming, but if it’s raining out and you’ve got a stack of zucchini… Depending on the size of your squash, figure 1-2 per person. Cut a small slice off the wide end of the squash. With a squash corer, or a small spoon, carefully core the squash, leaving about 1/4″ all around. Be careful not to pierce the skin. Set aside. In a large sauté pan heat the olive oil over medium-high heat. Add the onion, sauté for 5 minutes. Add the ground lamb, breaking it into small pieces as you add it, along with the garlic, cinnamon, pine nuts, salt and pepper. Stir to mix well. Add the rice and mix well. Remove from heat and place in a bowl to cool. When the mix is cool, use it to stuff the squash. The easiest way is to use your fingers, but you can do it with a small spoon. Fill the squash 3/4 full to give the rice room to expand. Set aside. In a large pot, big enough to hold the squash, over medium heat, mix the egg, yogurt, and cornstarch. Stir continually until it comes to a boil. Do not leave it unattended or the sauce will separate! When it comes to a boil (you’re safe now), reduce the heat to low, add a clove of crushed garlic, and the squash. Cover and cook for about an hour until the rice is cooked and the squash is tender. It may need more time to fully cook the rice. 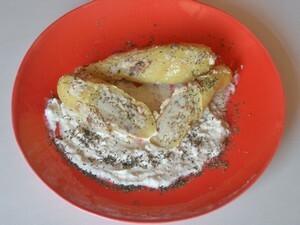 Serve with the yogurt sauce and mint sprinkled on top. Enjoy! Even though it’s in the 90’s here, the Accidental Locavore decided in the cool of the morning to make stuffed cabbage. It’s not hard, just a little time consuming. Par-boiling the leaves takes the most time (besides cooking them), but it’s certainly easy. Don’t let the lengthy looking directions scare you off. Core the cabbage and carefully remove the leaves until they get too small and gnarly to work with. Fill your biggest, flattest pan with water and put it on to boil. I added salt to the water, but don’t know how necessary it is. Force of habit. Place a few of the cabbage leaves in the water. You need to cover them with water, so don’t do more than 5 at a time. Boil until just tender and pliable. Repeat with the rest of the leaves. Put them on a plate, or clean dishtowel to drain and cool. 1/2 pound of ground lamb (from local grass fed lambs). When the leaves are done, cut the spines out of the leaves. If they’re big leaves, cut them in half the long way. Spoon a heaping tablespoon of filling about an inch above the bottom of the base of the leaf. Fold up the bottom to cover the filling. Fold in the sides, and roll up, easy right? Take all the leftover small pieces of cabbage, and the spines, and line the bottom of a large flat pan with them (I use the same pan as for the leaves). 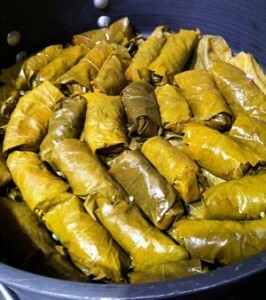 Place the rolls in the pan so they’re resting on the seam (the end of the leaf). Dot with butter, about 2 TBSP, and fill the pan with water to cover the rolls. Place a large plate on top to hold them down. Heat on medium heat until boiling, then turn down to a strong simmer for 30-35 minutes until tender. I like a yogurt sauce with these, and now that I know how to work with yogurt, it’s really easy. The two things you must do are: use whole milk yogurt. Any low fat yogurt will separate. Trust me. The other thing is to add egg yolks to the yogurt. For about 1 cup of yogurt, I used 2 egg yolks. Beat them slightly to combine them, and stir into the yogurt until combined. Combine all ingredients in a sauce pan and heat slowly until warm, and the sauce is combined. You can pour over the stuffed cabbage or even warm the cabbage in the sauce. Enjoy! A lot of people have great recipes for stuffed cabbage. What’s yours?